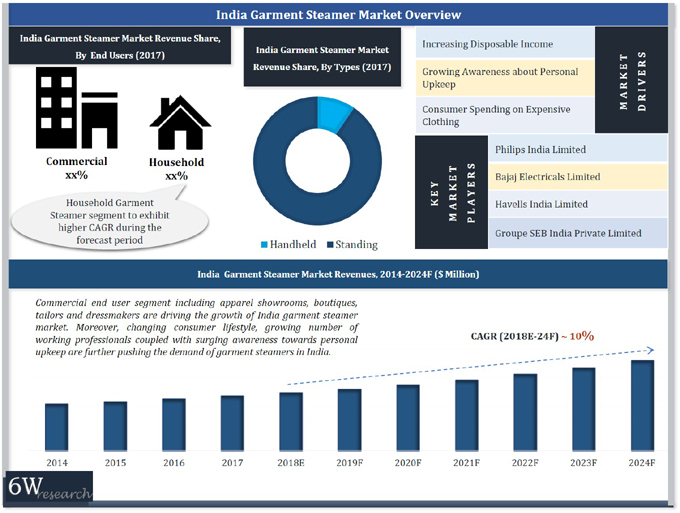 Rising personal disposable income, increasing consumer spending on expensive clothing, growing number of working professionals as well as rising need for proper maintenance of apparels are driving the growth of garment steamer market in India. Although, commercial end users dominated the overall market in 2017, however, household segment is projected to exhibit highest growth rate during the forecast period. The growth is attributable to surging product awareness among consumers along with certain key benefits of garment steamers such as portability, ease of use, and suitability for all kinds of fabrics. Among different end user segments, the commercial segment including apparel showrooms, boutiques, and dressmakers remained dominant end users of garment steamers. Moreover, household segment is emerging with surging demand for garment steamers at homes for delicate fabrics required to remove wrinkles gently. The India garment steamer market report thoroughly covers India garment steamer market by types, end users, and regions. The India garment steamer market outlook report provides an unbiased and detailed analysis of the India garment steamer market trends, opportunities, high growth areas and market drivers which would help the stakeholders to decide and align their market strategies according to the current and future market dynamics.